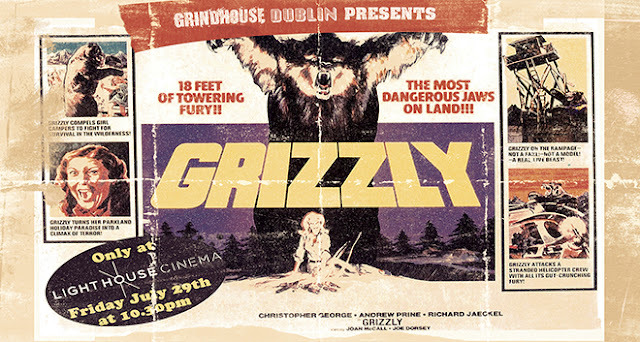 Grindhouse Dublin, in association with Light House Cinema, are thrilled to announce our Friday 29th, a 40th Anniversary screening of Grizzly! Get ready for 18 feet of gut-crunching, man-eating terror with this 40th anniversary screening of this cult grindhouse favourite, which sees a mammoth sized bear reign havoc inside a state park during the height of camping season. After three poor souls are mauled to death by the monstrous creature, a wild-life expert (Richard Jaeckel), warns the locals of the gigantic grizzly. With the aid of Ranger (Christopher George) and chopper pilot (Andrew Prine), the three set out to hunt down the colossal creature of catastrophic carnage! Join Grindhouse Dublin for this nature-runs-amok thrill-ride in all its eco-gory-glory at Light House Cinema, Smithfield on Friday 29th July at 10:30pm!